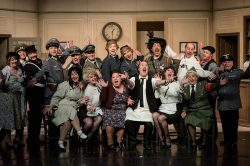 MATTHEW Rock’s Project Play, launched in 2018 with The Vicar of Dibley, returns this year with ‘Allo ‘Allo, on stage next at Frome’s Merlin Theatre from 23rd to 27th April. 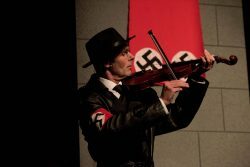 The unique touring model means that a number of amateur actors can put on the same play, with their own members using the same props, set and costumes. The cast can be drawn from a number of societies, and this years’ also come from Yeovil, first in the run, and Wimborne, where performances will be at the Tivoli in Wimborne from 2nd to 4th May. The ever-popular story of the French Resistance by Jeremy Lloyd and David Croft has been adapted from their seven-season television series. It embraces the adventures of the hapless cafe owner, Rene, in occupied France. Featuring all of your favorite characters, including Rene’s tone-deaf wife Edith, Major-General von Klinkerhoffen and the Gestapo officer Herr Flick! Rene and his wife have stashed a priceless portrait stolen by the Nazis in a sausage in their cellar, where two British airmen are also hiding until the Resistance can repatriate them. Communications with London using the wireless disguised as a cockatoo add to the many embarrassments this intrepid proprietor endures in the company of his patrons. Some dialogue may be considered unsuitable for younger children. Contact the the Merlin or the Tivoli for more details. Photographs of the Yeovil production by Len Copland.